FC Bayern München, Borussia Mönchengladbach and 1. FSV Mainz 05 all had something to celebrate on Matchday 33. 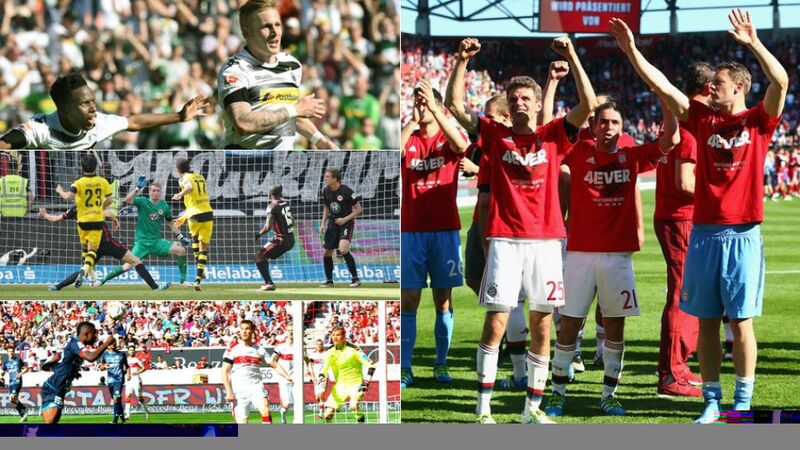 A record title wrap, relief for some and despair for others: the 2015/16 Bundesliga campaign's penultimate round of fixtures certainly did not disappoint. bundesliga.com reviews 90 or so soul-stirring minutes in German football's gripping top tier. They were made to wait, but FC Bayern München finally got their hands on a record fourth consecutive Bundesliga title thanks to a 2-1 win away to FC Ingolstadt 04. According to Bayern forward Thomas Müller, this season's race was the toughest of the lot: "We weren't handed anything on a plate. We were under pressure for a long time. Dortmund had a fantastic Rückrunde." Bayern's 25th Bundesliga crown brought up a number of milestones for head coach Pep Guardiola. The Catalan is the first non-German to win three successive Bundesliga titles and only the third ever after Udo Lattek and Ottmar Hitzfeld. He is also the only tactical whizz to get his hands on German football's top prize three times in his first three years as a Bundesliga head coach. With a brace against Ingolstadt moving him four clear of Borussia Dortmund counterpart Pierre-Emerick Aubameuang, Bayern striker Robert Lewandowski is almost guaranteed to finish the season as top scorer. The Pole is only the third Bayern player to post 29 goals in a single campaign after Gerd Müller and Karl-Heinz Müller, while he is now level with Klaas-Jan Huntelaar as the Bundesliga's leading single-season foreign goalscorer. Bayern could have dropped points and still got their hands on the prize, after lowly Eintracht Frankfurt inflicted a shock 1-0 defeat on second-placed Borussia Dortmund. It was the Eagles' third win on the bounce and crucially lifted them a point above the relegation zone ahead of next weekend's winner-takes-all encounter with 16th-placed SV Werder Bremen. Eintracht's mini revival gives them the advantage in the three-team battle to avoid being relegated to the second tier on the final day. A draw will suffice for Niko Kovac's men, while Bremen need to win to be sure of their place in the top flight. Second-bottom Stuttgart cannot climb higher than 16th, but must beat VfL Wolfsburg and hope Bremen lose to Frankfurt if they are to earn a stay of execution in the relegation play-offs. At the other end of the spectrum, Borussia Mönchengladbach are virtually guaranteed a place in the UEFA Champions League play-offs following their 2-1 win at home to Rhine rivals Bayer 04 Leverkusen. Andre Hahn netted twice to add to his side's already far superior goal difference ratio and put a three-point buffer between them and fifth place going into the final weekend of the campaign. It is the first time since 2009/10 that the Bundesliga's promoted clubs have avoided an immediate return to the second tier. Ingolstadt sealed the deal a fortnight ago in their maiden Bundesliga campaign, while Darmstadt have now done so at the third time of asking following fleeting top-flight visits in 1978/79 and 1981/82. Darmstadt, Ingolstadt and Mainz are some of the biggest stories of the season so far, but what about TSG 1899 Hoffenheim? The Sinsheim club have undergone quite the transformation under the Bundesliga's youngest-ever head coach Julian Nagelsmann, taking 23 points from the 39 on offer since the 28-year-old replaced Huub Stevens at the start of February. Despite losing 1-0 to relegated Hannover 96 on Matchday 33, they will be playing Bundesliga football next term.